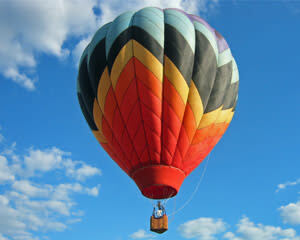 Climb aboard a hot air balloon and drink in the lush, rolling hills of the New Jersey or Pennsylvania countryside. What do you do when you see a hot air balloon? If you're like most people, you stop. You “ooh and ahhh” and point it out to your friends excitedly. Floating peacefully on the wind. Looking down on geese and other winged creatures flapping below. How different and how peaceful the world must seem from up there. Climb aboard and drink in the lush, rolling hills of the New Jersey or Pennsylvania countryside. You'll know what it's like to be up there. And the memory will last the rest of your life. Perfect for anniversaries, birthdays or “just because”. Plan your balloon adventure with us today. I would like to thank Tom and Christina for the wonderful exprience and the thrill it gave my wife to be on her birthday..
Great ride conditions wonderfu l staff educational informational and I fed in high confidence in the staff. Flights depart at sunrise or 2 hours before sunset. Departure times vary depending on the time of year.